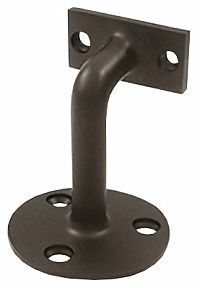 This attractive solid brass wall bracket is ideal for high use and durability in public areas. Fits 2in. tube/rail. Note: This product is also known as HRC253U10B, DEL-81597 on other websites. Rail Mounting plate: 1-7/8in L X 1in W.
Comes with: (3) #12x1 in. screws and (2) #8x1 in. screws.